SHIMMER is a small wireless sensor platform designed to support wearable applications. It provides an extremely extensible platform for real-time kinematic motion and physiological sensing. 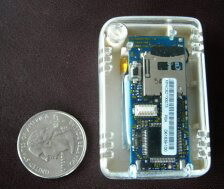 It features a large storage capacity and low-power standards based wireless communication technologies which facilitate wearable or wireless sensing in both connected and disconnected modes. SHIMMER provides an extremely compact extensible platform for long-term wearable or wireless sensing using proven system building blocks. The design is realized using conventional design and assembly technology to ensure repeatability and economy. SHIMMER will help to create an ecosystem of health-related technologies that provide a highly mobile capability which is tightly integrated with supporting infrastructure. • Integrated Li-ion battery mgmt. SHIMMER was designed in 2007 by Benjamin Kuris, with Firmware by Steven Ayer and Mechanical design by Doug Bennett. All three are members of Intel's Digital Health Group.